If you are planning a wedding for this fall, this is the perfect time to decide on your motif and get your details planned. 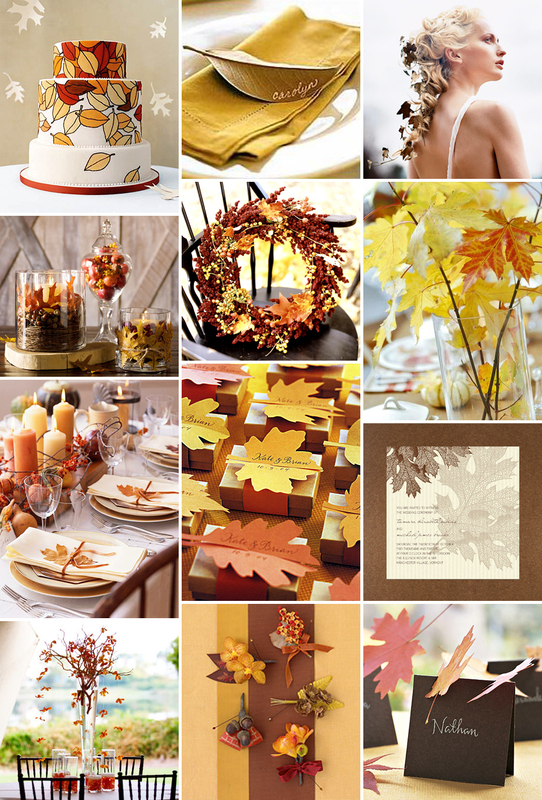 A wonderful theme for an autumn wedding is acorns and oak leaves. Acorns symbolize good luck and oak leaves represent strength and longevity - what an auspicious start to your marriage! Introduce your autumn motif in your save-the-date cards and invitations. An acorn with several oak leaves can be letterpressed onto your stationery in a fall color such as ochre or mocha. It would be very nice to have the leaves "tumbling" down from one corner of the invitation. A simple font in a rich burgundy or chocolate brown would look great for the lettering. With so much meaning behind your theme, you will want to be sure to share an explanation with your guests. Your wedding programs can be the perfect chance to say a few words about the luck and longevity behind the acorn and oak leaf motif. A short paragraph can be placed at the bottom of your program, or even on the front cover. Certainly there will be many ways that you can use your motif throughout your wedding decorations. Consider using real branches of oak leaves in beautiful fall colors as part of your centerpieces. An alternative to actual leaves would be antique velvet leaves, which would be rich and beautiful. These can easily be combined with fall flowers in warm yellows, oranges, and reds to create magnificent centerpieces. Such a beautiful theme can even be carried into the wedding attire. The bride could think about having an acorn and leaf design hand embroidered somewhere on her gown, such as the train, or on a sash at the waist. Choose warm colors for the design that will tie in with your flowers and bridesmaid dresses. Handcrafted bridal jewelry in a warm color like copper or bronze would make a lovely accent. You can choose bridal jewelry that is handcrafted with sparkling crystals or lustrous pearls for that perfect bit of flair. Your wedding cake is always the perfect place to highlight your theme. Ask your baker to create little marzipan or sugar acorns and leaves to decorate your cake. For a fall wedding, you might want to have a cake in a richer flavor, like chocolate or a spice cake. Some real leaves scattered on the cake table would be a nice touch. A tasty and beautiful cake is the perfect sweet ending to a happy wedding day.